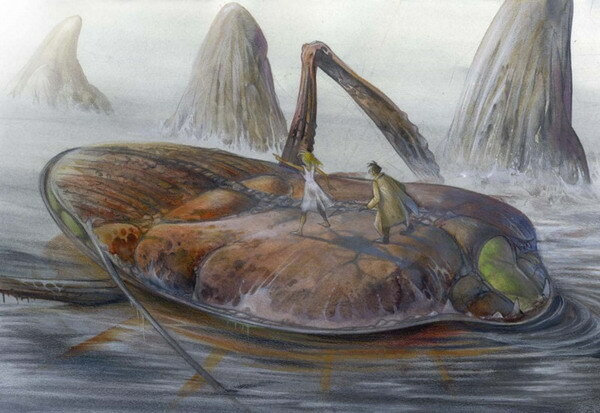 Aquarica is a long term project by Benoît Sokal and François Schuiten. 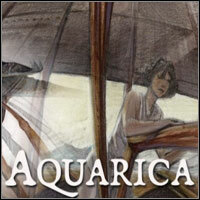 It was in 2006 that game publisher White Birds announced its plans to create a video game called Aquarica 1). White Birds was founded by Benoît Sokal, Olivier Fontenay, Jean-Philippe Messian and Michel Bams in August 2003 2). Sokal had already worked on games like Amerzone and Syberia at game publisher Microïds 3). 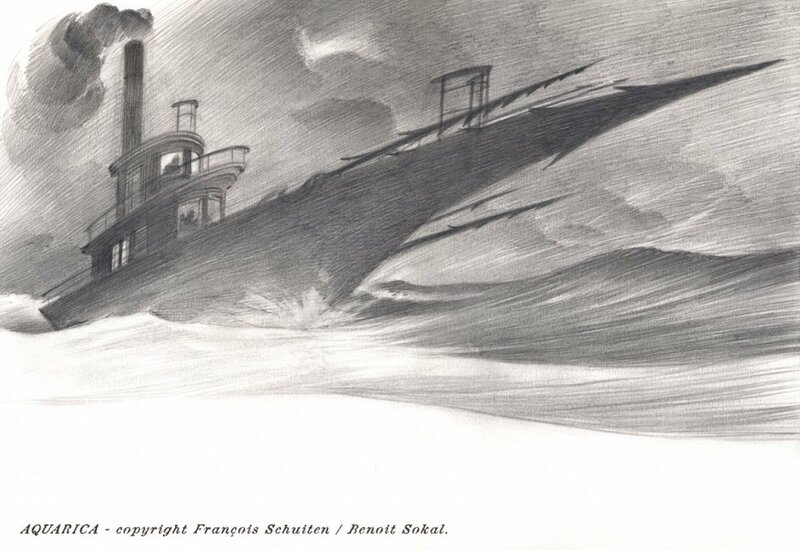 After finishing Paradise he started working together with François Schuiten on Aquarica. The theme of the game would be about environmental issues and man’s relationship to nature. From the beginning there was also the ambition to turn the project into an animated feature film 4). 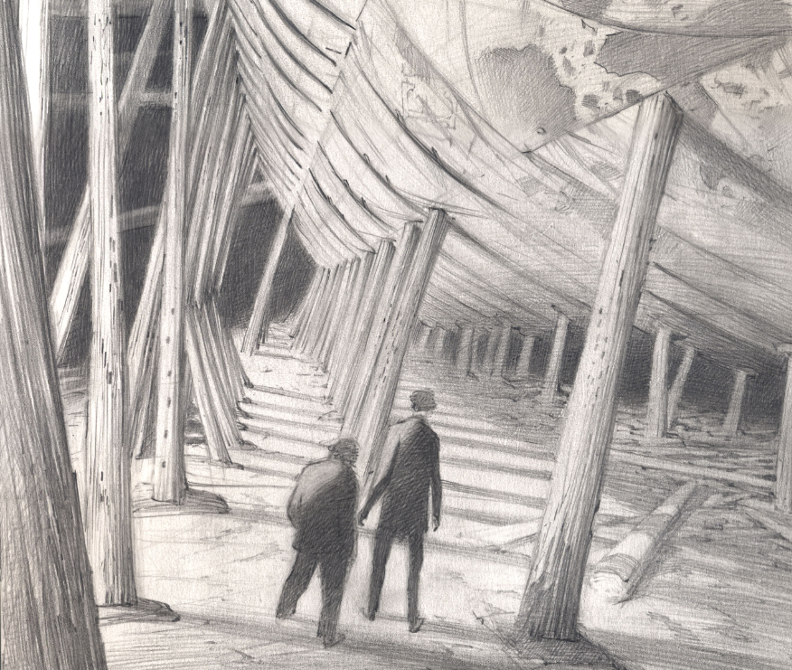 In the gallery below, you can find the first sketches by Sokal and Schuiten’s combined hands. Around 2008 the PC game market was quite difficult and White Birds Productions shifted its focus on Nintendo. 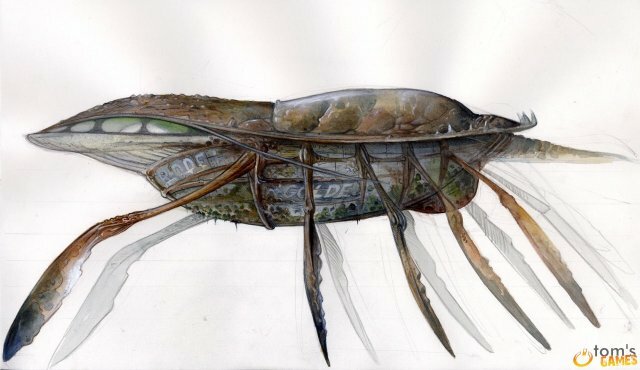 The plans to create the video game Aquarica were then shelved 6). But the intention of producing an animated movie was still on 7). In 2011, White Birds Productions closed 8). 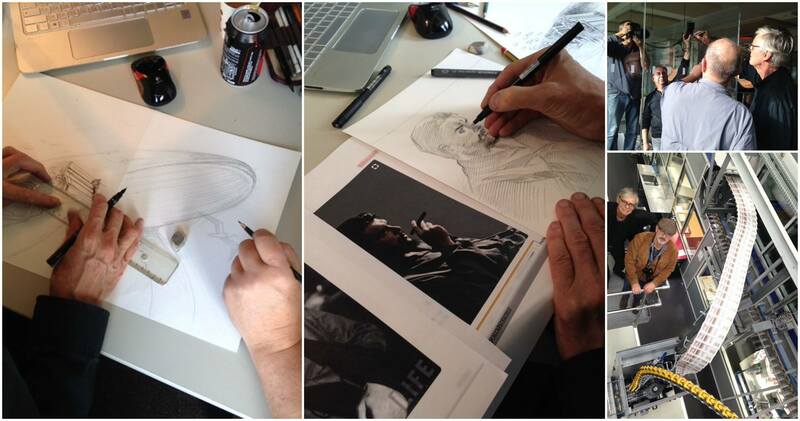 In 2012, filmmaker Martin Villeneuve joined the project, after working with François Schuiten on Mars et Avril. 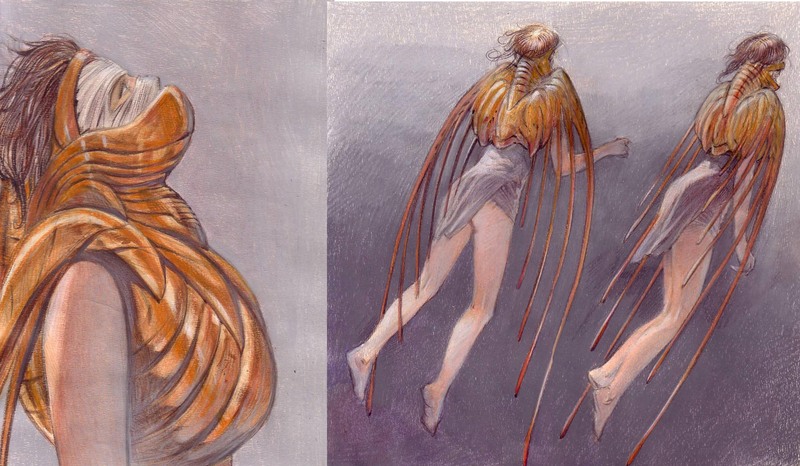 Sokal, Schuiten and Villeneuve picked up the idea of making an animated movie. Aquarica will be an animated fantasy feature film – Villeneuve will direct, while Schuiten & Sokal will act as production designers. The film will be produced by Pierre Even (Brooklyn, C.R.A.Z.Y.) at ITEM 7 in Canada, in co-production with Europe and/or Asia 9). The project received development support from SODEC in 2013 and 2015, and from The Harold Greenberg Fund in 2016. The current plan is to to finance the film in 2019, and to produce it in 2020. 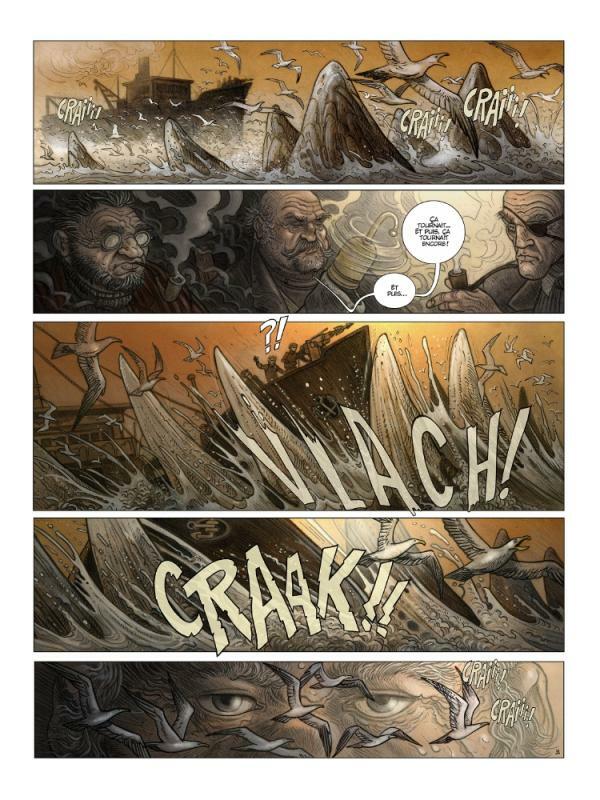 The project is also adapted into a comic book by Sokal and Schuiten. The album is published in two volumes by Rue de Sèvres 10). The first volume was published on October 11, 2017 11) 12). The second volume is expected in 2019. Benoît Sokal, Martin Villeneuve & François Schuiten during their working session in Southern France in July 2014. François Schuiten and Benoît Sokal photographed by Martin Villeneuve during their working session in July 2014. The idea of the story is more than 10 years old. The original story takes place in 1932. 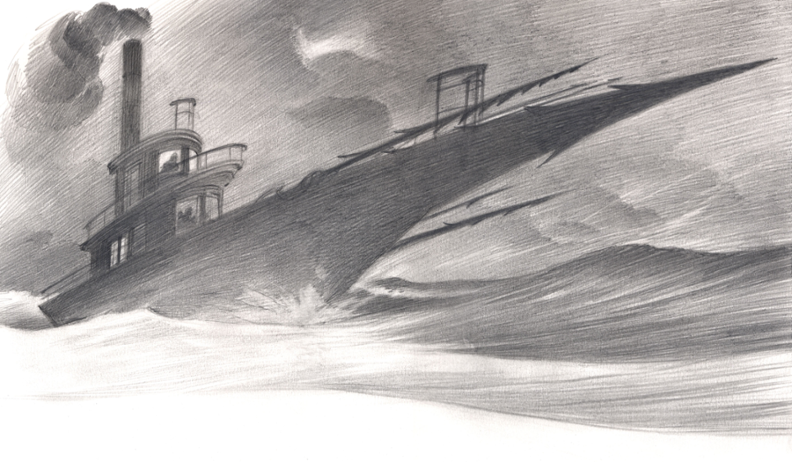 One day, the inhabitants of Roodhaven – a once flourishing whaling port – discover a strange boat washing up on shore. It is assembled out of various bits and pieces of whaling ships that have long-since disappeared. 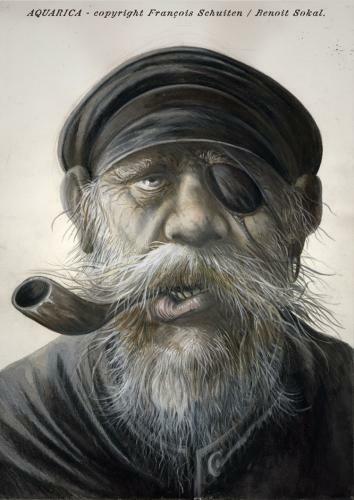 Aboard this vessel, they find a young woman, Aquarica, who presents herself as the great-granddaughter of Jeremy Connolly, the captain of the schooner “Aquarica”, lost at sea over a hundred years before. She speaks of her people, who live on a mysterious island out in the middle of the ocean; an island that has, almost imperceptibly, started to slowly move northward, as if becoming alive and responding to a strange and irresistible call. 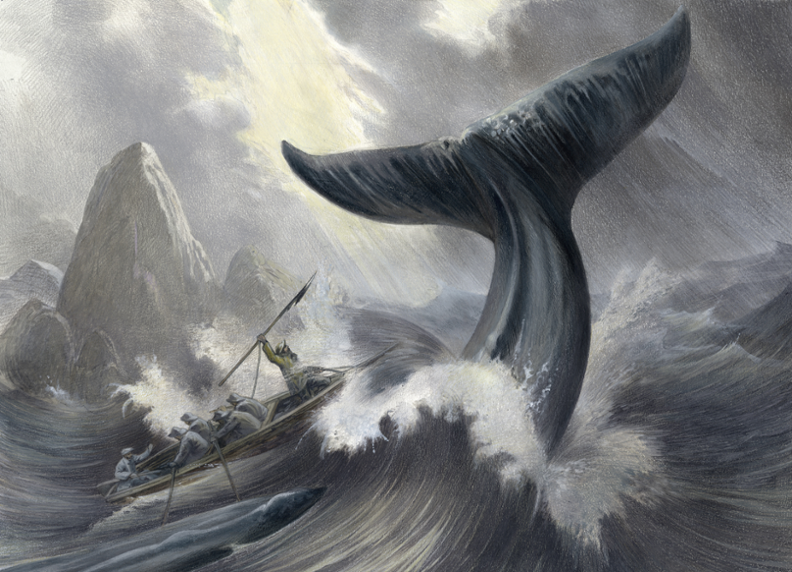 What if the famous legend of the giant whales were true? Sailors the world over have heard about these mythic sea-beasts known as “mastodonwhales”, but no one has ever seen one. These gigantic whales are said to float in a state of near-lethargy at the heart of warm sea currents, their backs covered with mineral soil. A luxurious vegetation springs from these camouflaged garden-backs, even giving rise to an indigenous wildlife and an isolated tribe of humans. But once every hundred years, the mastodonwhales set out upon a voyage, back toward the frozen waters of their birth, in order to reproduce. For the love of Aquarica, a young scientist, John Greyford, will try to save the people of the island and above all preserve the mastodonwhale from the crazed and murderous whaling fleet of Captain Will Baltimore, fierce commander of the fastest whaling ship in history, the “Slayer”. If the story told in the comic books, or even in the movie, follow these lines is still uncertain. 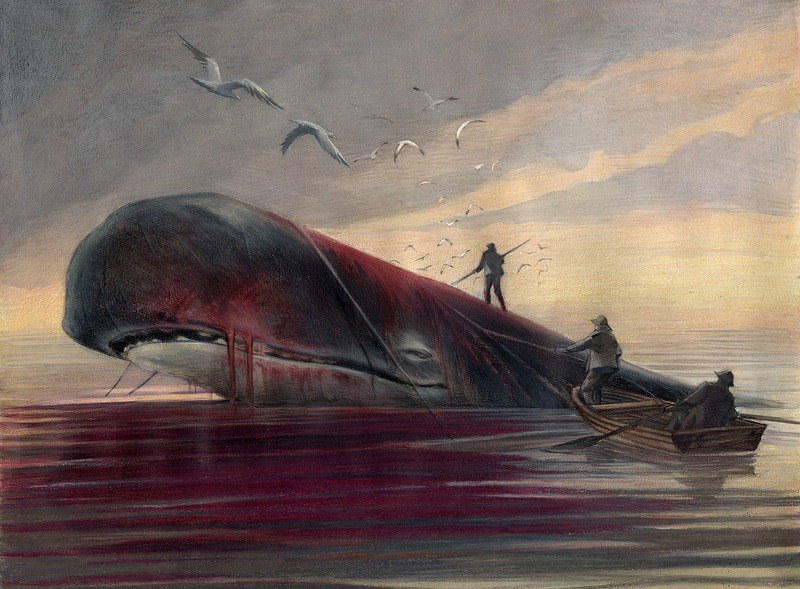 According to its title, La Baleine Géante, the second volume will introduce the giant whale. Before becoming an animated feature film, Aquarica is first adapted into a comic book by Benoît Sokal and François Schuiten. The script for the comic book version is written by Benoît Sokal and François Schuiten. The designs and dialogues are by Benoît Sokal. Also, the cover of the first album was made by their four hands 14). The album is published in two volumes by Rue de Sèvres 15). 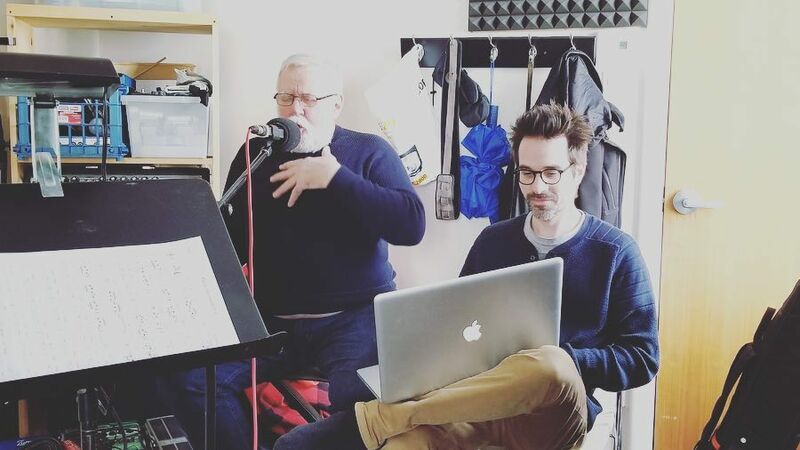 Rue de Sèvres published this photo in May 2017 teasing the album’s release 16). 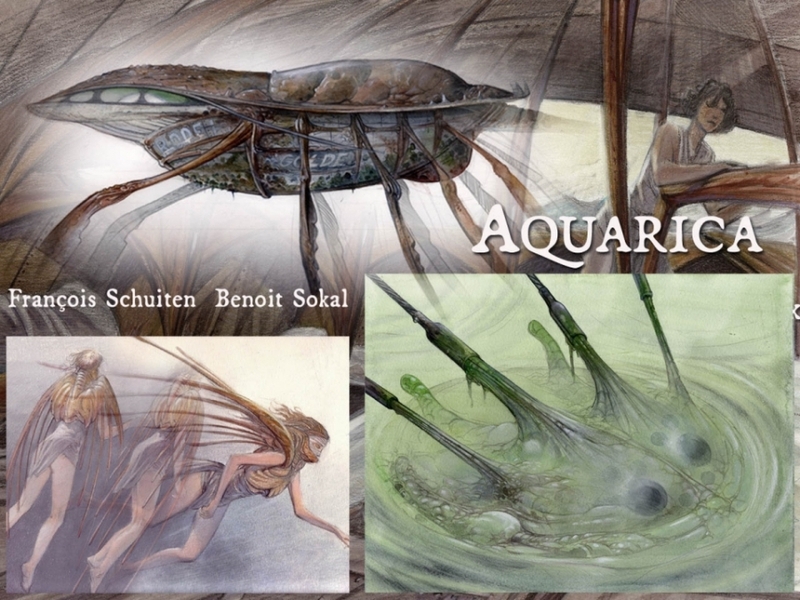 The first volume of Aquarica is titled Roodhaven. The 72-pages album was published on October 11, 2017 by Rue de Sèvres. Some pages of Aquarica - Roodhaven. 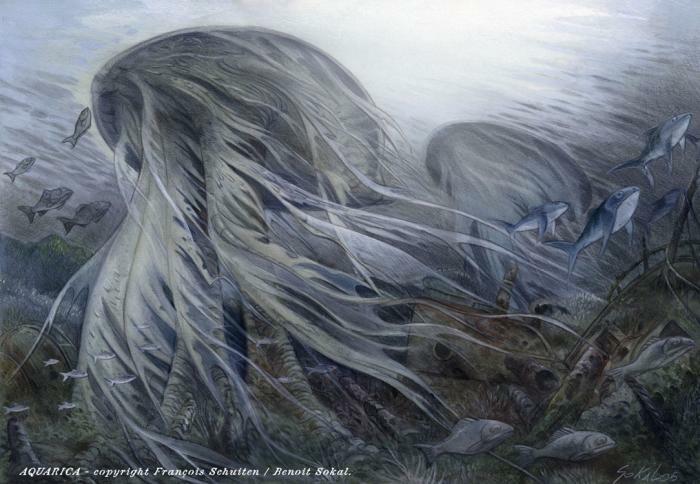 Upon the release of the first volume of Aquarica, Benoît Sokal and François Schuiten were invited to spend the day at the headquarters of Ouest France, to illustrate the next DOF (Dimanche Ouest France), which appeared on October 8th 18). See also: Ouest France with Benoît Sokal. 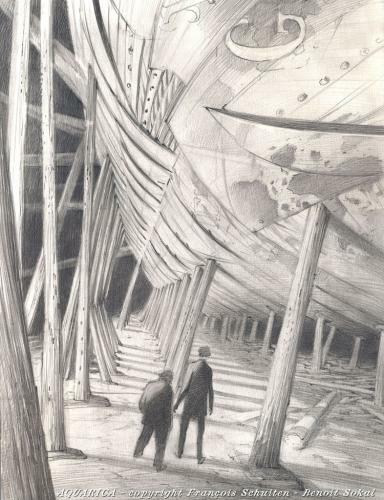 The title of the second volume will be La Baleine Géante. Publication is expected in 2019. 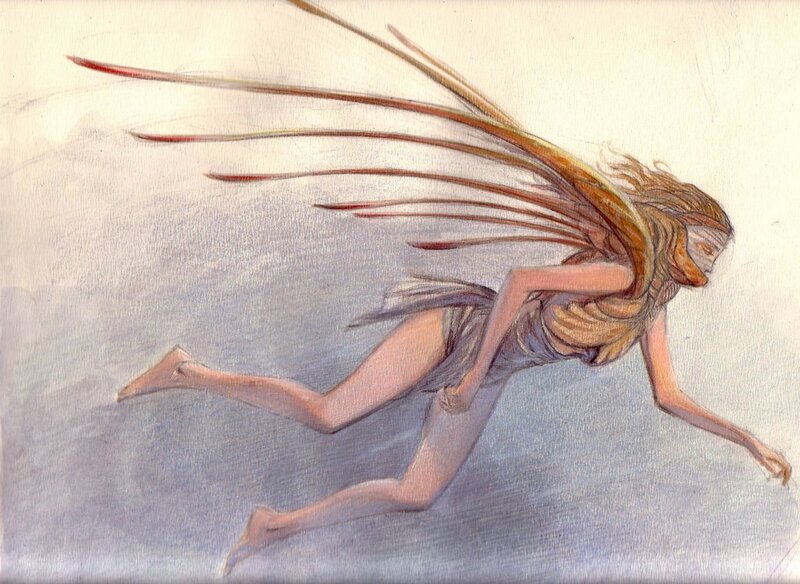 The animated feature film Aquarica is a collaboration between Martin Villeneuve, writer, director and producer, and European comic book masters François Schuiten & Benoît Sokal 19). Martin Villeneuve started working on the script after making his feature film debut with Mars et Avril, upon which he collaborated with Schuiten 20). 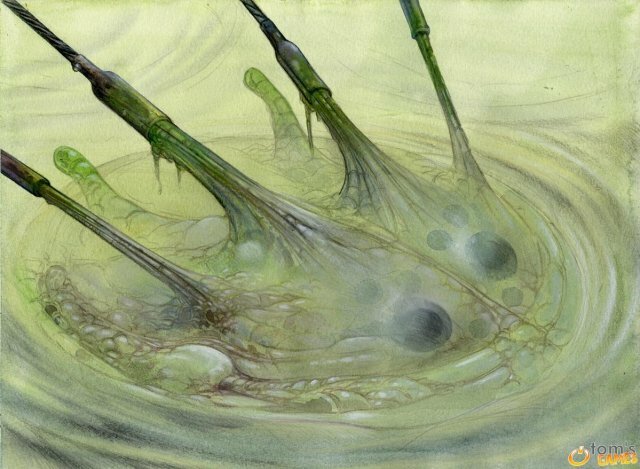 Aquarica will be an animated fantasy feature film – Villeneuve will direct, while Schuiten & Sokal will act as production designers. The film will be produced by Pierre Even (Brooklyn, C.R.A.Z.Y.) at ITEM 7 in Canada, in co-production with Europe and/or Asia 21). It received development support from SODEC in 2013 and 2015, and from The Harold Greenberg Fund in 2016 22). 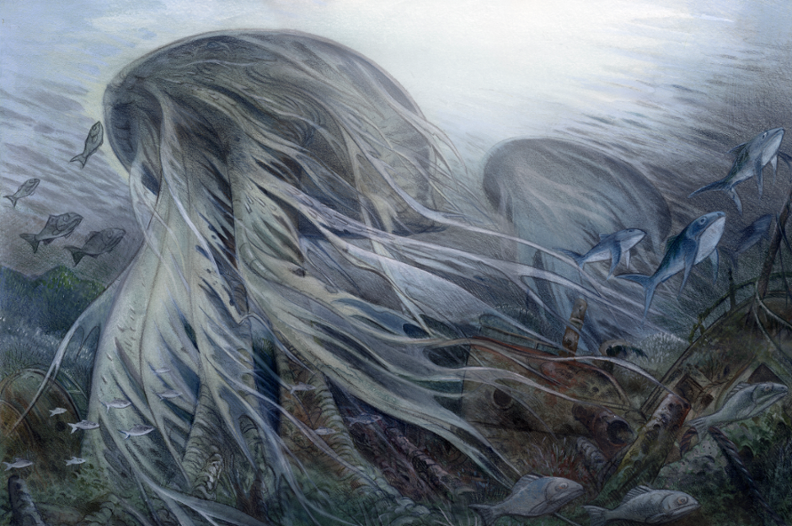 Aquarica metaphorically tackles the theme of climate change, through the prism of a beautiful love story and a quest full of unexpected twists and reveals. The story takes place in a parallel world in order to better expose and dramatize the paradoxes we face today: nature created us, nurtured us and we are part of it, yet we are altering its delicate equilibrium. In the world of this film, the boundaries between science and myth are blurred, stimulating the viewers’ imagination, questioning our relationship with nature, and pushing the limits of what we think is visually possible. Full of strange, otherworldly technologies, this fantastical, ultra-modern animated movie will deliver us into a thought-provoking and visually stunning narrative universe that will dazzle the imagination 24) 25). Although Aquarica raises important questions and deals with matters of import in today’s society, it is first and foremost a deeply entertaining story, intended to appeal to a wide audience. It is indeed easy to grasp the stakes of this adventure and to identify with its endearing and deeply human characters. 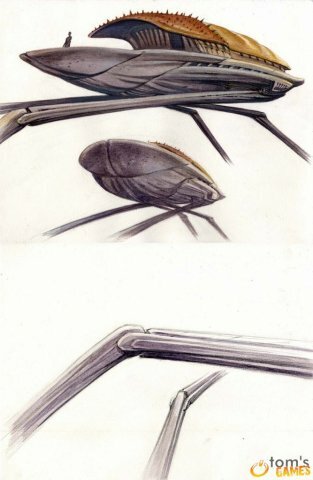 Furthermore, the outstanding artwork from Schuiten & Sokal and the astonishing inventiveness behind Martin Villeneuve’s first feature film, betoken a very exciting creative fusion 26) 27). Due to his extremely tight budget, Martin invested seven years of his life and his crew worked for a fraction of their normal salary to bring Mars et Avril to the screen. It is a true miracle that he cannot possibly repeat a second time. However, Aquarica will surely benefit from all the lessons learned from this first feature – the tricks and techniques developed to reduce the budget while maximizing the end result. 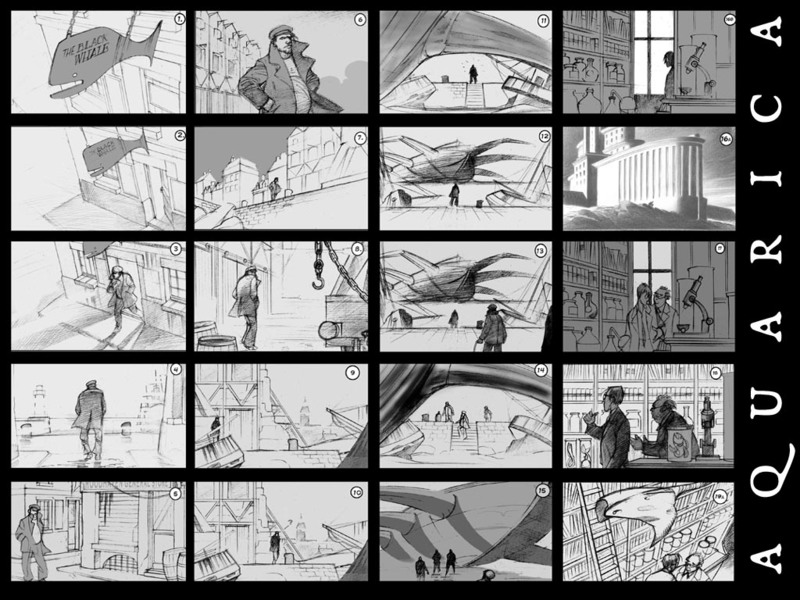 As with Mars et Avril, each shot of Aquarica will be carefully planned through an animatic of the whole film, leaving nothing to chance and putting creative and financial resources to full and efficient use 28) 29). What made you chose a girl to save the world in Aquarica? Is it a comment on global warming? How do we save ourselves? Do you think we will save our planet? See The Cozy Sweater Café for the full interview! 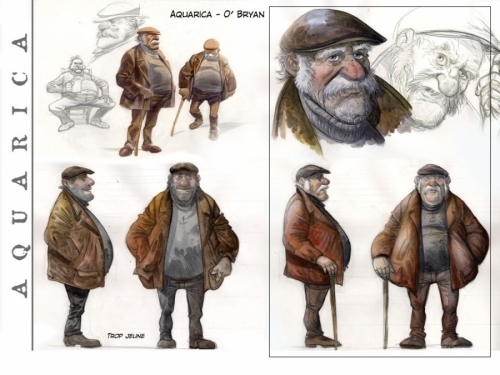 Aquarica got development support from SODEC in 2013. A first draft of the script was then complete and the project was selected for the third edition of the Frontières Market. Born from the popularity of many other co-production markets around the world and the complete lack of events specifically dedicated to the genre film industry, Frontières became the first market to exclusively focus on genre film co-productions between North America and Europe. To participate in Frontières, the selected projects have to be market premieres with a completed script and must be applicable to an international co-production environment where there is ideally a Canadian production element involved (either in terms of production location, cast or crew, or post-production facilities). They need to have a producer or production company attached, although some exceptions have been made for exceptional talents looking to find a new producer. The third edition of Frontières was held in Brussels from April 10 to 12, 2014 during the Brussels International Fantastic Film Festival. 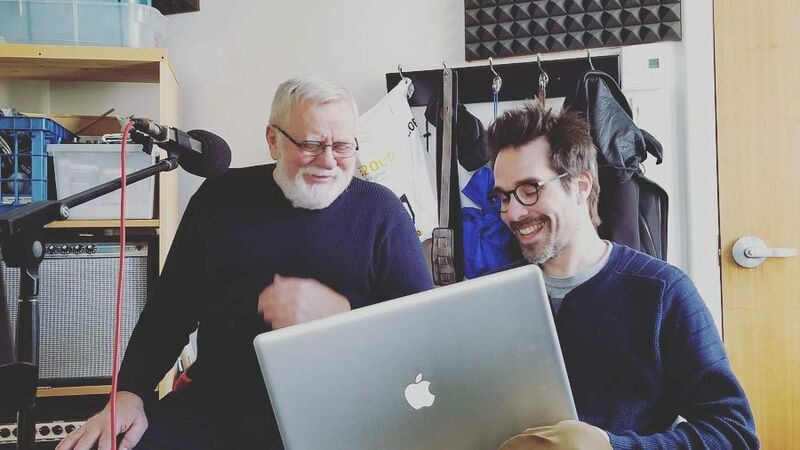 The artistic development of the film marks the new collaboration of the director with famous Belgian illustrator François Schuiten, this time joined by fellow comic-book artist Benoît Sokal. Benoît Charest (The Triplets of Belleville) is already attached as a composer. ITEM 7 is now seeking potential creative partners in Europe and/or Asia, pre-sales and any potential post-production deals involving tax rebates and development funding 31). 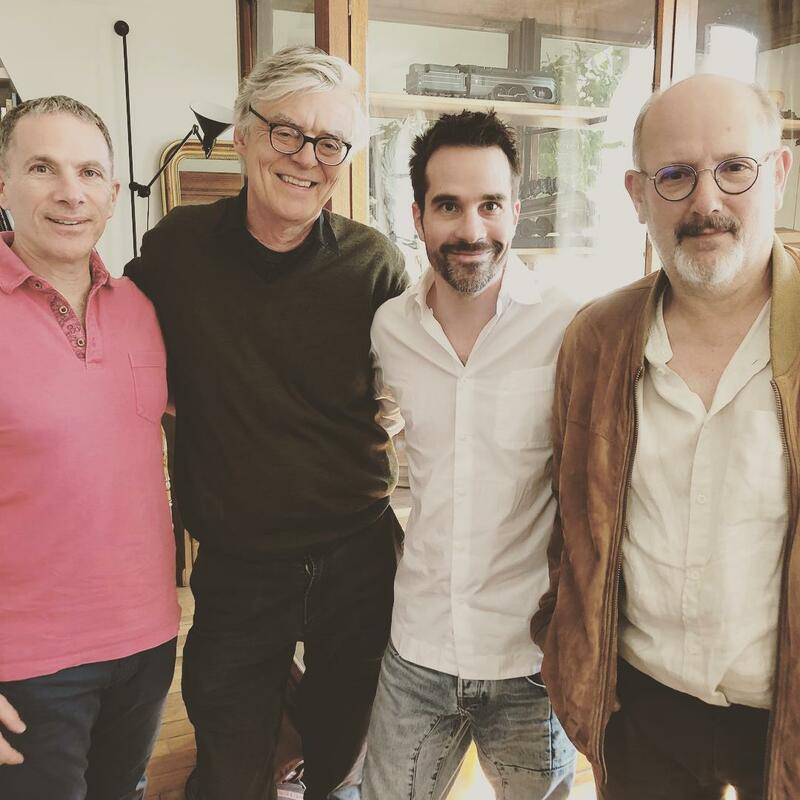 In May 2018, director Martin Villeneuve and producer Pierre Even visited Paris to meet with Benoît Sokal and François Schuiten to discuss the Aquarica movie. According to Villeneuve: “Aquarica: not yet in a cinema near you, but another step in the right direction!” 32). 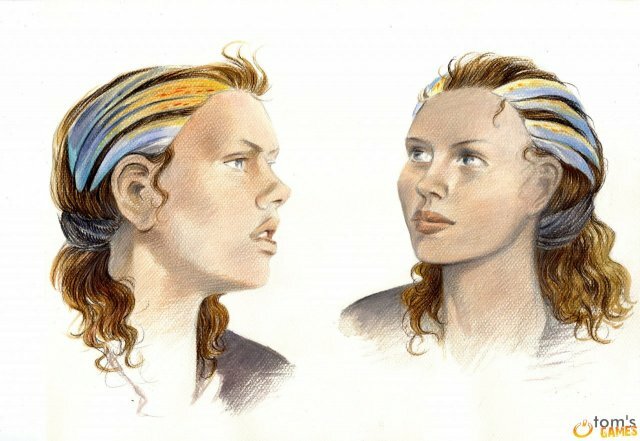 In July 2018, Schuiten & Sokal met in Southern France to do some visual tests with the main characters. 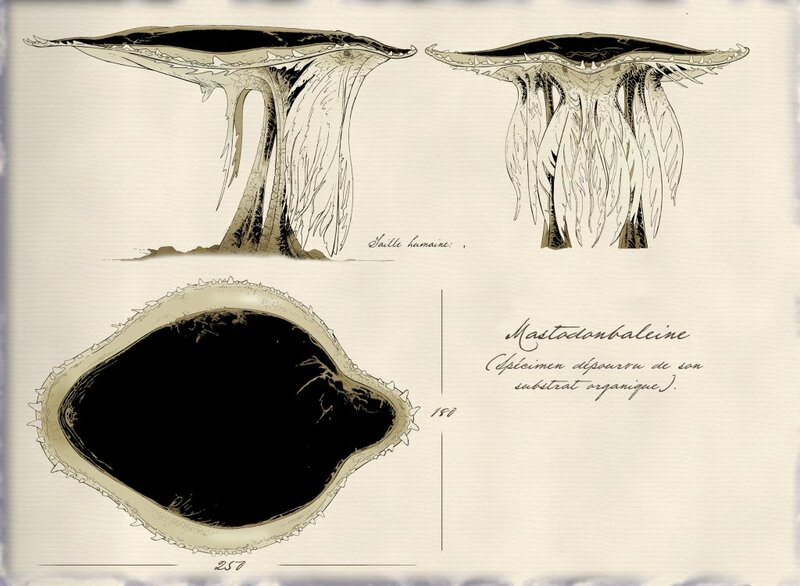 Gallery with the first sketches by Sokal and Schuiten for their Aquarica project.